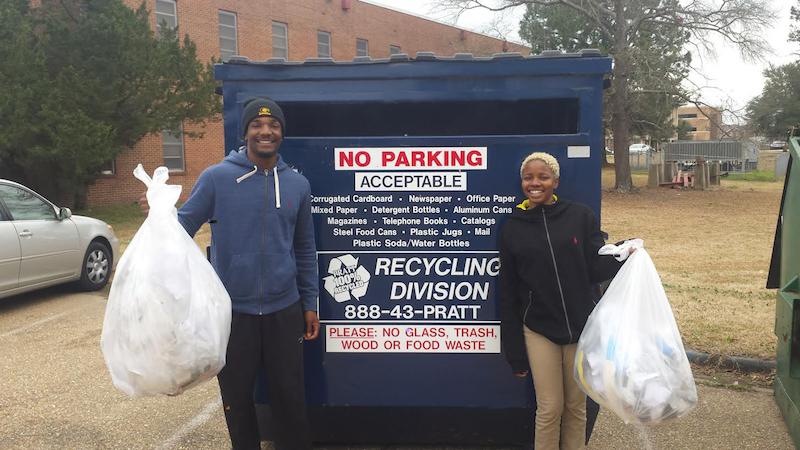 Pratt Industries has teamed with Grambling State University to provide students with a cleaner, greener campus through a college-wide initiative to replace regular trash cans with recycling bins. The program will allow the student body to participate in the collection of recyclables on campus – eventually providing an income stream for the famed university – as well as establish a recycling partnership with the City of Grambling, La. Mandel Davis, a Pratt Recycling Division representative and Grambling graduate, said both Pratt and the University recognized the benefits of an on-campus recycling program. The project will roll out in three phases. First, 12 containers will be placed around campus to reduce landfill waste, and the student body is asked to participate in the collection of recyclables from these bins. Grambling has already designated a site and building for this operation and sees it as an opportunity for them to use the project for a work-study program. Baling of the material will generate revenue for the university. The Student Government Association supports the recycling initiative and has agreed to collect a student fee each semester to go towards the overall recycling project. It’s estimated the average college student produces 640 pounds of solid waste each year! “We only have one planet, so it is time to take care of it before it is too late,” junior Criminal Justice major Rana Williams told the university student newsletter. Phase three will involve the school partnering with the city of Grambling to collect recyclables from its citizens. Mayor Edward Jones has already agreed to to this partnership. “The citizens are elated about the prospect of recycling,” he told the student newsletter. “They have been asking me when we are going to get started.